Posted bykellyjomcd	 July 31, 2012 July 31, 2012 Leave a comment on Polo is the sport of kings….and kids! Winston Churchill famously once said, “A polo handicap is your passport to the world.” When someone brings up Polo, one may have visions of sleek horses thundering down the grassy fields in London, England, or even Santa Barbara, California and Greenwich, Connecticut. One associates the sport with kings, not kids. So it came as a surprise that this sport can also be a passport right here in good old Minnesota. 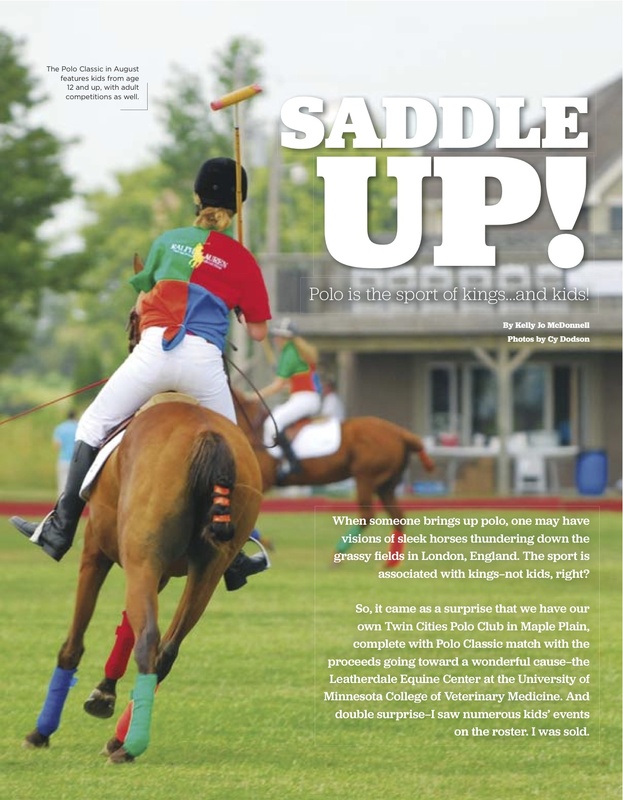 We have our own Twin Cities Polo Club in Maple Plain, and there was a Polo Classic match right around the corner. And surprise! I saw numerous kid events on the roster. I was sold. After all, the sport of Polo has been played for centuries; it was time to experience the thrill of the sport. And the proceeds go for a wonderful cause-the Leatherdale Equine Center at the University of Minnesota College of Veterinary Medicine. Explaining this to my 9-year-old son, Hayden, was something else. “We’re heading down to Maple Plain,” I explained, “we’re going to a polo match!” Hayden stared blankly back. I continued. “It’s a game played on horses, and they hit a ball around with a mallet. It’s like hockey on horseback.” He seemed to accept that explanation. “Is it like the guy on those one shirts?” he asked. Ah- Ralph Lauren. Sold. While the polo matches are played May through September, we caught the 22nd Annual Polo Classic the end of July. It was going to be a hot one, temperatures in the low 90’s and muggy. It was a beautiful drive though, and the polo field wasn’t hard to find among the sprawling pastures. Hayden enjoyed watching the polo players prep their horses in the heat, while I grabbed some bottles of water from the horse trough. There were many things to keep the kids entertained, from face painting, to jumping in the bouncy tent, to riding a horse-drawn carriage around the grounds. The U of M Raptor Center was on hand, and there were several games set up, all horse related. If your kids are into horses, this was the place to be. Several retail tents were peppered along one side of the field; St. Croix Sadderly, Pink Equine, and Refuge horse farms. There was even a Ralph Lauren “Big Pony Collection” cologne booth, with bright colored bottles with taglines such as “Be a winner! Be part of the team!” Before I could stop him, Hayden had sprayed himself with several of the samples. The schedule of events seemed foreign to us non-polo people, but sounded fun all the same. Gates opened at 11:00 a.m.; At 12:00 was the Twin Cities Polo Club Youth Match. Hayden loved seeing kids from age 12 and up on the field warming up the polo greens. “It is wonderful,” said Craig Robbins, Polo Classic Co-Chair, “Our Youth Polo Group, ages 12 up to 20 play in the youth program. The kids learn about the sport, and the youth polo match showcases some of the kids that play. It gives them an opportunity to show what they can do!” I was pleased to see several long ponytails streaming in the wind behind a few of the players helmets. I poked Hayden. “Those are girls!” I exclaimed. He rolled his eyes. “They haven’t scored yet, Mommy”. As if on cue, one of the girl players thundered passed us and chucked a ball right in the goal. After the Youth Match, we witnessed the Long Lakes Hounds Demonstration at 12:45. We learned that the Long Lake Hounds club was founded in 1959, and is Minnesota’s only hunt. No worries-it’s a “drag” hunt, meaning it doesn’t hunt or involve live foxes; a fox scent is dragged on horseback to simulate the path a pursued fox might take over the fields or through the woods. Hayden enjoyed watching the numerous hounds being corralled by riders around the field. The opening ceremony was at 1:45, and as Hayden put it, “it was time for the big guy polo.” “The Polo Gods are smiling on us!” exclaimed the announcer. Smiling? It was 94 degrees. But I suppose that meant that it wasn’t raining. We were learning. Robbins directed us to the large Equine Center tent. “It’s a fun community event,” he explained, “ It gives you a change to meet one another, and helps build that community effort.” We nestled ourselves in the shade of the large tent, which had perfect seats along the side of the polo field. It was organized with tables of information on the Equine Center’s programs, which are for teaching, research, clinic care and community outreach for advancing the health, wellbeing and performance of horses. The Center boasts a 60,00 square feet facility that supports the growing University of Minnesota equine program. Home to nearly 500 state and local horse clubs, Minnesota has more than 155,000 horses- the ninth largest horse population in the United States! As we drove back to the cities, I reveled in the feeling that my son and I had enjoyed something completely new…and we learned a thing or two along the way. I could still smell the faint scent of Polo in the air. The Polo God’s had indeed smiled on us.